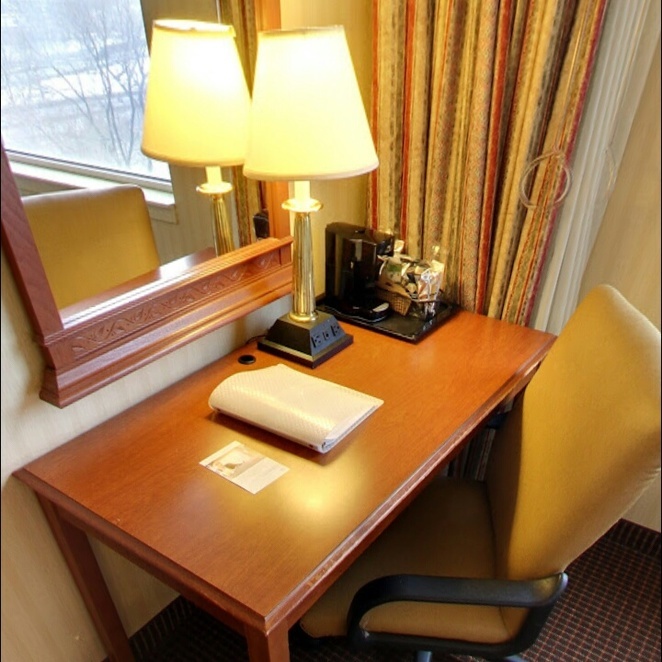 The Hampton Inn NY- JFK is perfect for a city holiday in New York - Queens. All sorts of attractions, such as Rockaway Beach, the Brooklyn Museum, Prospect Park and the Green-Wood Cemetery are all within a relatively short drive. Located a five-minute drive from John F. Kennedy International Airport. Free airport shuttle available 24 hours a day, 7 days a week. Clean, comfortable rooms with flat-screen TVs, coffeemakers and mini-fridges. Executive Lounge Upgrade offers complimentary breakfast, afternoon drinks and spaces. 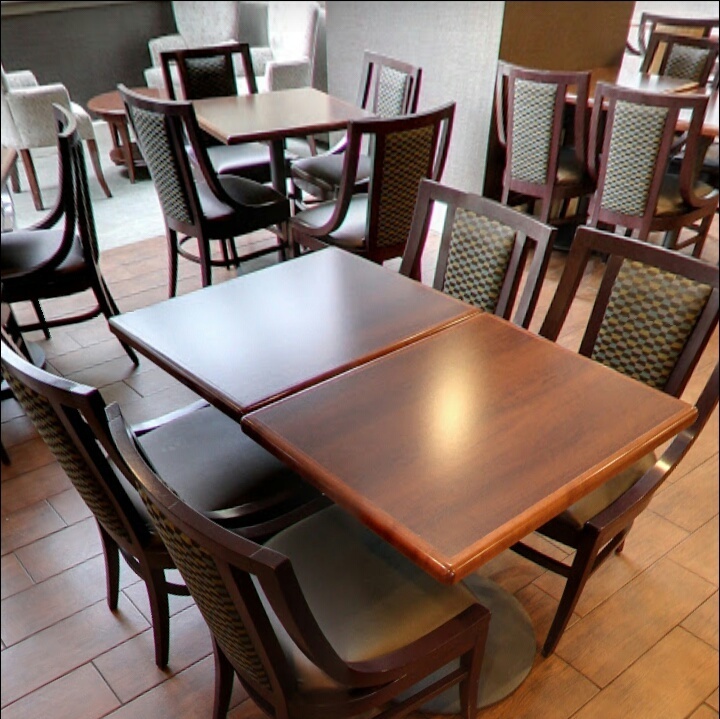 Full-service restaurant, bar and cafe with Starbucks. Indoor saltwater pool. 24/7 fitness centre with a good selection of Precor cardio equipment. 24/7 business centre with four computers and two princesses. On-site parking and car rental countries. A gift shop sells sundries, souvenirs and spaces. Meeting space for up to 500 people. Hotel Hampton Inn NY- JFK Airport is a large airport hotel that remains busy around the clock as travellers arrive or depart to flights out of the nearby JFK at all hours. It is particularly busy early in the morning and at rush hour in the afternoon. The lobby has fairly low ceilings but is nicely decorated with tile floors and wooden columns. A relaxation area with comfortable chairs is the opposite of the large registration desk. The staff are friendly enough but with so many guests visiting for short stays, this is the best place. Most interactions usually occur at the restaurant and bar that are right next to the lobby. Despite being close to the airport and busy roads, the hotel is surprisingly quiet. 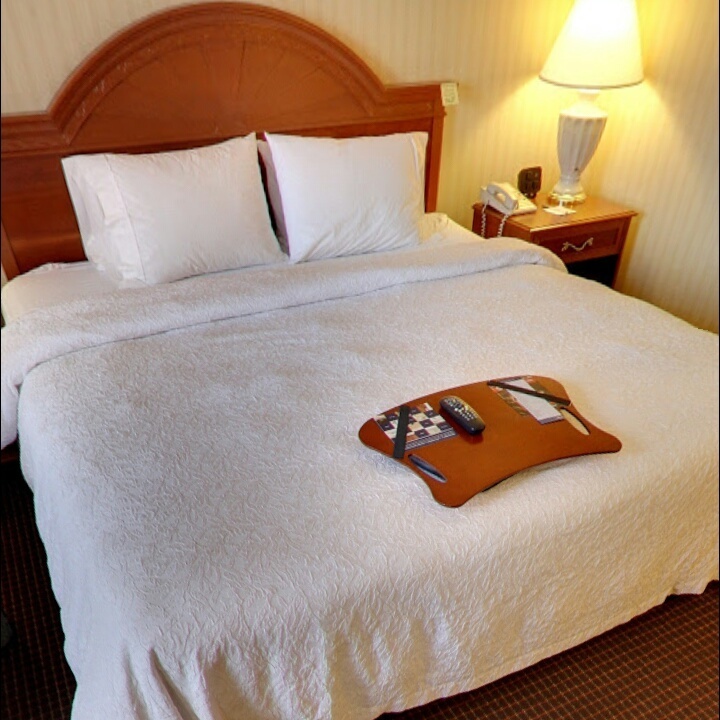 Rooms are tastefully decorated in a simple style that is often seen in Hampton hotels. The soft tones of the earth are pleasant with light walls, white duvets and beige, olive and light blue squared patterned carpets. The matching wooden furniture has a beautiful amber finish, but many of the pieces I saw had obvious signs of wear. Standard rooms offer plenty of space and Queen double rooms include desks and upholstered armchairs (King Rooms have small sofas). Larger suites with sofa beds in separate lounges are also available. Amenities are a plus, with flat-screen TVs, mini-fridges, coffeemakers and safes. Wi-Fi is free. Executive rooms located on higher floors provide Executive Lounge access with free breakfast and free afternoon snacks, beer and wine. 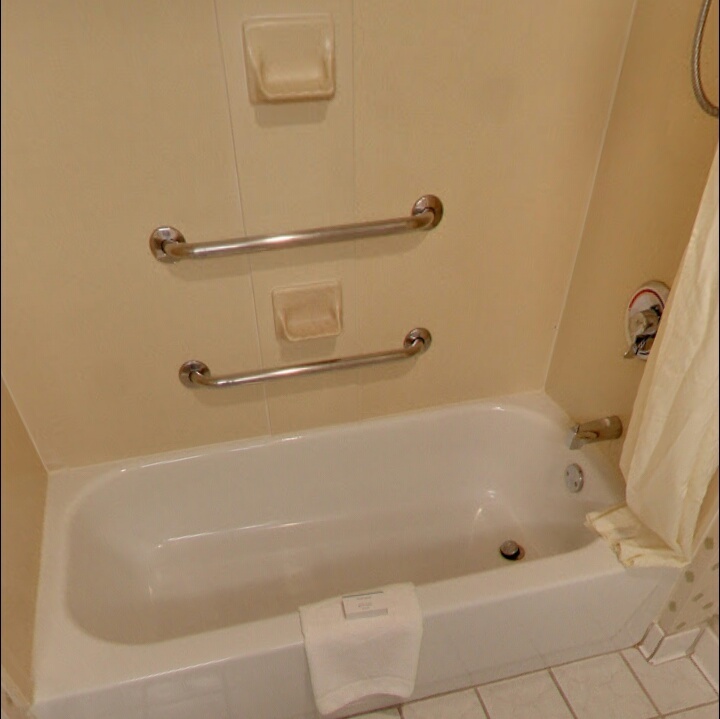 Bathrooms vary according to room type: King rooms have walk-in showers, while double rooms with double beds feature showers/bathtubs. 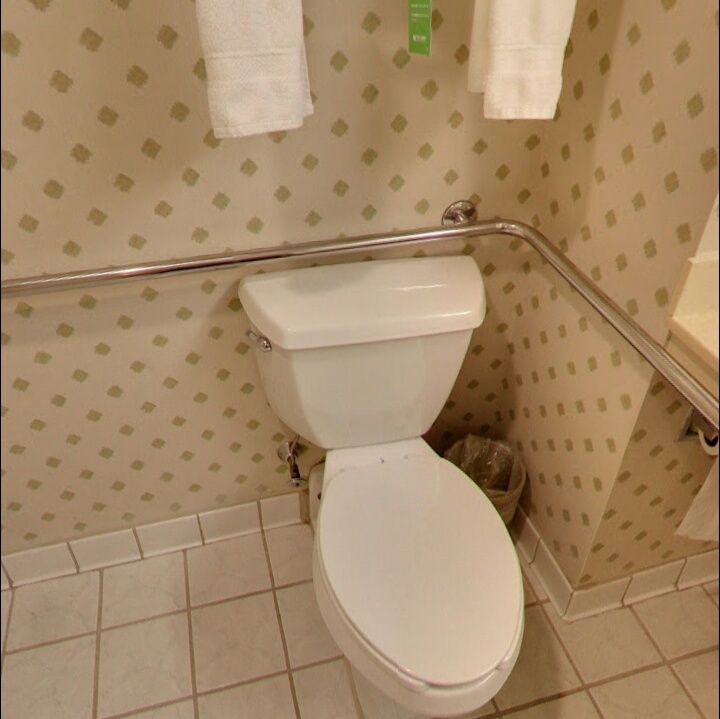 The bathrooms are medium in size but have excellent lighting, magnifying mirrors and spacious beige granite furniture. One floor of the hotel allows smoking in the rooms. The rooms are made brighter by the natural light that passes through the large windows, many of which offer views of the airport (especially on the upper floors). 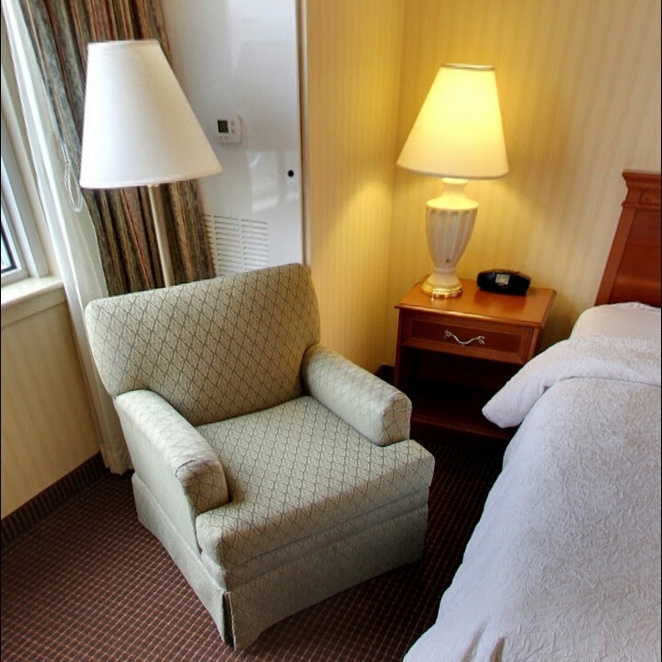 The Hampton Inn NY-JFK Airport hotel has rooms with air conditioning. The house has a fitness and a luggage room. The rooms are accessible by foot or elevator. For added convenience, wake up service, dry cleaning and laundry are also provided. A free parking is available for cars. Guests can arrange airport transfers from the property.